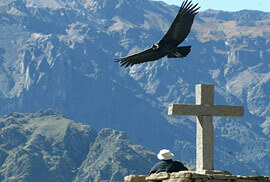 Our excursion offers a majestic and unforgettable experience in Arequipa and at the Colca Canyon. Come and live your experience with us. You will travel through impressive landscapes, discover with us the history of villages by visiting pre Inca tombs, sculptures. During this trip you will have the opportunity to discover different atmospheres as the Colca canyon and the Natural Reserve with its wild life such as vicunas and in Arequipa the white city, you will have the opportunity to discover different monuments as the “Molino de Sabandía”. Today, we will explore the colonial city of Arequipa, built with blocks of white volcanic stones and therefore also called “the White City”. During a panoramic bus tour we will visit the Main Square, one of the most beautiful squares in Peru. In the center of this plaza is located a fountain with the statue "Tuturutú" on the top which is an important symbol of Arequipa. There is a myth about Tuturutu saying that it represents a sixteenth century soldier. Then, head towards the viewpoint of Carmen alto from where you can enjoy the panoramic view of the White City and the impressive Misti volcano, which is an active volcano towering over Arequipa. We continue our tour to the district of Yanahuara with its colonial streets and buildings as well as the traditional district of Cayma. Continuing our tour, we stop at the outlet and zoo Incalpaca, where you can observe different Andean camelids such as llamas, Alpacas and Vicunas. On our way we will pass by the artificial lakes Tingo and Sacha on our way to “Molino de Sabandía”, a construction from the XVI century and return to the center, crossing the Paucarpata district with its beautiful pre-Inca terraces. 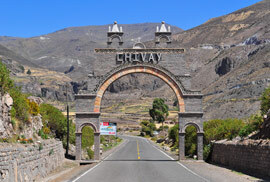 At around 7:30 a.m, we will pick you up from your hotel and start the trip to the Colca Canyon passing Yura village. We will go to Pampa Cañahuas (National Reserve of Aguada Blanca and Salinas), habitat of the beautiful South American vicuna camelids. In the wetlands of Tocra we will appreciate a huge variety of migratory birds, including flamingos. Then, we will pass by the crater of an extinct volcano: Chucura. We will stop at the viewpoint of the volcanoes, which is also the highest point of the trail (4,800ml) where we will see the impressive Cordillera Occidental, one of the deepest canyons in the world. We will arrive to Chivay at approximately 13:30 to 14:00. You will have time to go to your hotel and have lunch. In the afternoon we will enjoy a relaxing bath in the thermal waters (optional) whose medicinal waters range from 35 to 38 degrees centigrade in the pools. After your breakfast around 06:30 we will travel by bus to the viewpoint “Cruz Del Condor”, a strategic point in the canyon where you will watch the spectacular flight of the condor. On our way back to Arequipa, we will stop in the towns of Pinchollo, Maca and Yanque; which they have beautiful colonial churches, as well as the viewpoints of choquetico and Antahuilque, where we will observe the impressive view upon the valley, tombs and Pre-Inca sculptures. 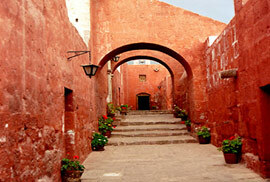 We arrive in Arequipa at around 06.00 pm.